This indoor/outdoor fabric is stain and water resistant and perfect for outdoor settings and indoor sunny rooms. It is fade resistant. 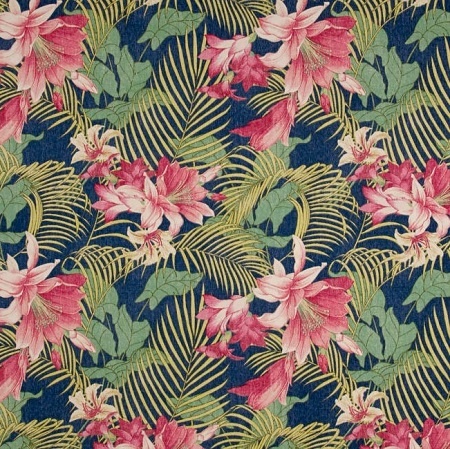 Perfect fabric for porches, patios, deck side, pool side. Create cushions, upholstery and great for tables, totebags and more. Colours include navy blue, pink and green. This fabric can be easily cleaned by wiping down or hand washing with warm water and a mild soap solution. Simply rinse with clear water to prevent dirt from embedding itself in the fabric. Please choose your fabrics carefully as we cannot refund or credit once cut. We recommend that you request samples before ordering any fabrics as computer images do not necessarily offer a true indication of colour or size or pattern. Swatch sample size is approximately 10cm x 15 cm.